people are resoluting to be healthier. And this year Michael and I are very much amongst those peoples. We have a wedding to prep for! This recipe is a great way to bring in this new year! Michael loves pizza rolls and um...they're horrid for you. So I made these as an attempt to create a healthier copy cat. Are they the same as pizza rolls? No. They're not. HOWEVER they are delicious and still a tasty, lighter, little snack. 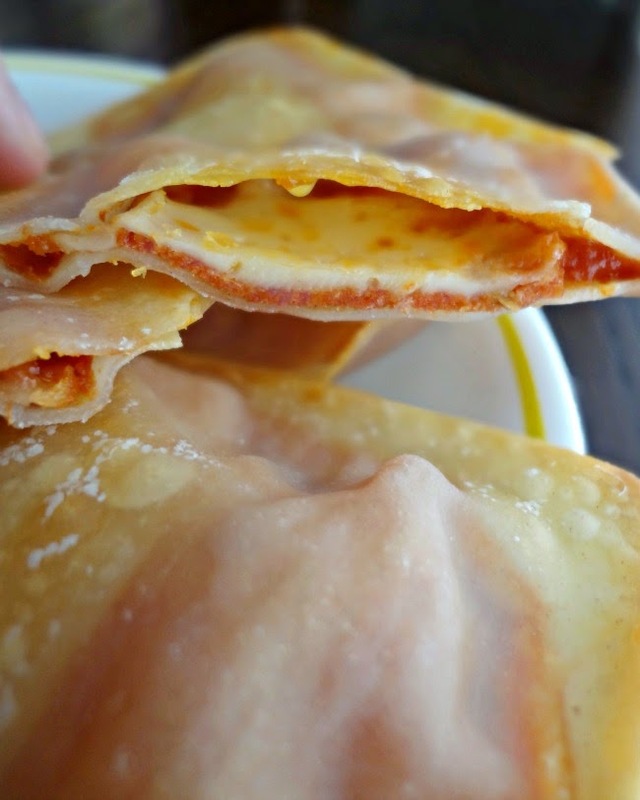 You just use some wonton wrappers and, really, stuff whatever you want inside--if you want to get really healthy put some spinach and chicken in there (I tried to stay close to the inspiration with pepperoni and cheese). 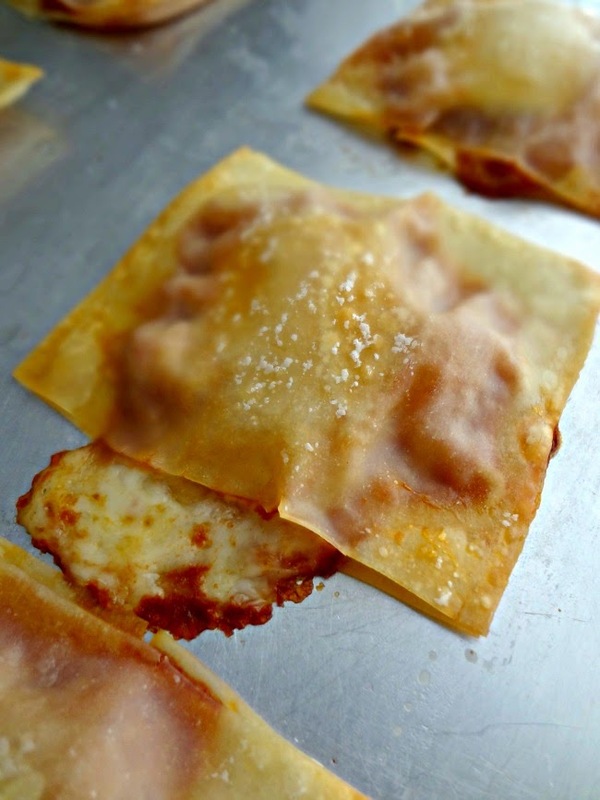 They're crispy/crunchy, easy, and a crowd pleaser! Preheat oven to 400F degrees. Spray a large baking sheet with non-stick cooking spray. Lay out 1 egg roll wrap on the prepared sheet, fold the top over the bottom so you have a rectangular half. Use a sharp knife or pizza cutter to cut in half of that (so you have 2 folded squares). Unfold each square and position the two halves about 1-2 inches apart. Repeat with the rest of the egg roll wraps (or you can fill and do this as you go along). Place about 1/2 tbsp. of tomato sauce in the center of one unfolded half. Place a piece of pepperoni on top and then a piece of the cut up mozzarella string cheese. Wet your fingers and use that to moisten around all 4 edges of the square. 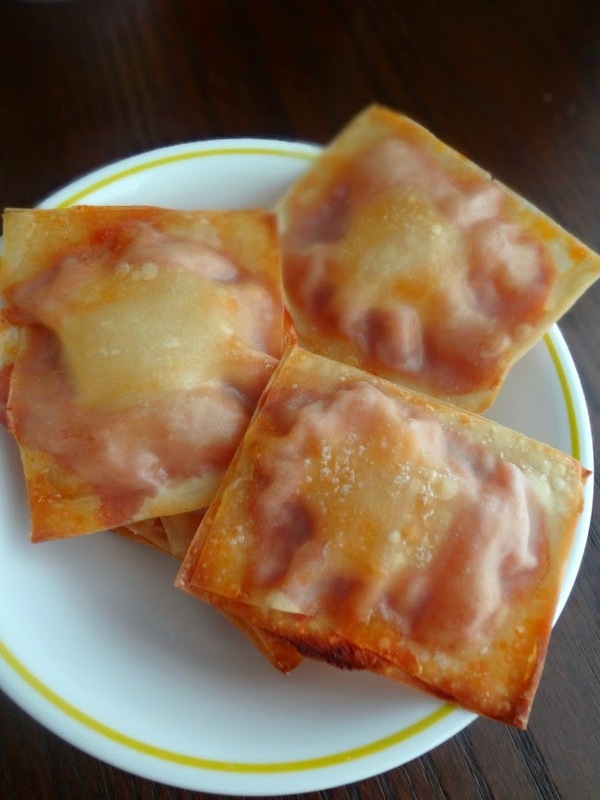 Re-fold the top half over the assembled pizza roll and press moistened edges together to seal. 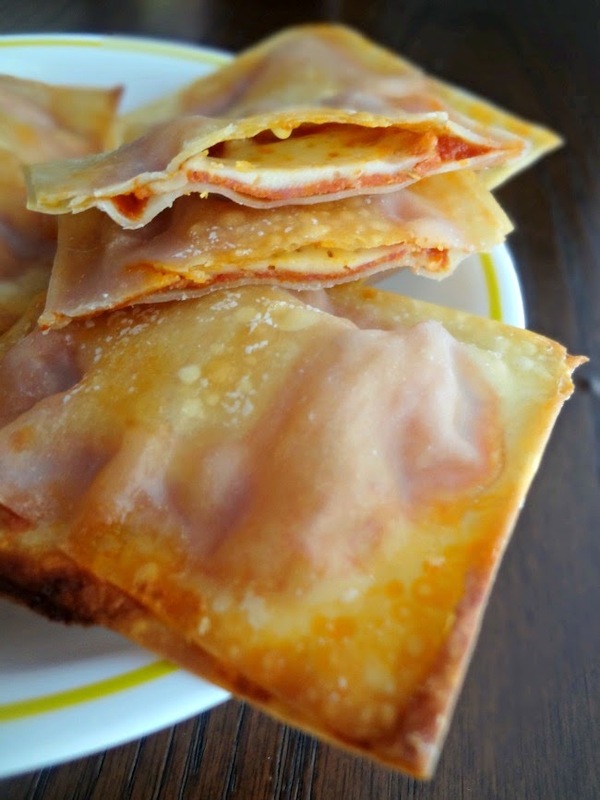 Repeat this process until you have 16 total "pizza rolls" on your baking sheet. Spray each pizza roll with non-stick cooking spray or lightly brush with olive oil. Bake for 10 minutes, until crisped and golden brown around the edges. Cool and serve! Best served fresh but you can store leftovers in an airtight container in the refrigerator for up to 3 days (and reheat in a 300 degree oven or just in the microwave). Pshhh who needs fried food when you can get that crispiness in the oven? ?